MR ALTWEGG: Good afternoon, nice to be with you all again. Next view graph, please. I've got about four view graphs, and I'll talk to the view graphs, and then I'll be available for questions. Our budget request for '11 is $8.4 billion, up about half a billion (dollars) over fiscal year '10. And the budget supports continuous emphasis on development, testing, fielding, sustainment. And we have shifted our emphasis from the ground-based defense against intercontinental ballistic missiles to the regional threat, short- and medium-range missiles, which comprise about 99 percent of the ballistic missile threat extant. We also -- as announced by the president on 17 September of '09, we are starting the four-phased approach to fielding a capability in Europe against the emerging Iranian threat, initially against, again, the short- and medium-range threat that exists, and hence our initial emphasis will be on Southeastern Europe. Now the objectives that we established at the start of the POM season were, in short, homeland defense; regional defense; proven, meaning adequate testing; and hedging against the future. And each of those enterprises has enjoyed an increase from '10 to '11, except for the hedge against the future, which has dropped off about a billion- plus (dollars). Now I want to say something about testing, not to ignore the other three objectives, but in '09, in about December of '08, we laid our testing program out on the table, and we developed some criteria to a number called critical engagement conditions, or CEC, and empirical management event, EME. And we required, and collectively we developed, criteria that became CECs or EMEs, and which led to almost a complete reordering of our test program. And why did we do that? Well, we can't afford any more to conduct the number of flight tests that we used to, for instance, when I was a lot younger. At $200 million a flight test for a ground-based system, 80 (million dollars) to $90 million a flight test for a Aegis or THAAD, it's just not affordable, for instance, to conduct 30 flight tests to determine a confidence level sufficient so that the director of operational test and evaluation would be comfortable. What we do now is we capture the right data so that we can develop high-fidelity models and simulations so that the warfighter in particular, and the testers to the same extent, have comfort that what we are fielding will, in fact, achieve the goals desired by the warfighter and the testers. So all of our flight tests, starting toward the end of last year, have these CECs and EMEs, and of course contributed data to our models and simulation, which on a continuing basis are updated so that they can be accredited by the testers. And we believe that about 2014 or so we will have these high-fidelity models and simulations. Here are some notional -- not notional, actual numbers in the budget for '11. And as you can see, THAAD and Aegis are benefitting. And again, it's this increased emphasis on regional threat. Now, I see you writing down numbers. I'm going to give you a copy of the overview. All those -- every number you've ever seen, they're all in the overview. You'd say, why don't you give 'em to you now. Well, as we discovered together some years ago, it turned out to be a quiz for me. Tests and targets. I've talked about the test program. Targets; we have an RFP program on the street today for a medium-range series of targets. We are about to issue one for intermediate-range ballistic missiles. And later this year we will put out an RFP for an ICBM target. And our goal is that by (20)12, we will start to achieve an inventory of targets so that when we experience a target failure, heaven forbid, we won't have to wait a year or so to repeat that flight test; that we'll be able, once we've determined, through a Failure Review Board process, why we had the failure; we can then go forth and, after correcting whatever we find was the cause of the failure, and conduct a repeat of the failed flight test. Now, the ABL is, as you all know, on the threshold of a shoot- down. It has been determined, however, that we will then induct the 747 ABL platform into a directed energy research program under the aegis of DDR&E. We will, for at least the foreseeable future, control the aircraft, but the whole idea is to use that as a platform for testing other directed energy weapons. And the way, fortuitously, the ship -- aircraft, that is -- is designed makes it very amenable to inserting other directed energy weapons in there to conduct tests. And there are other programs within the department under directed energy. Ours just happens to be the one with the greatest power output. That does not foreclose other approaches over time, with the advancement in technology, achieving the same power levels in a platform much less vast than a 747. Airborne infrared sensors, a new effort, our attempt to exploit UAVs. We had been since last summer conducting all of our flight tests with -- almost all of our flight tests with participation by Reaper aircraft. And the last two efforts have been Navy Reapers manned by Air Force flight crews. And we are very impressed with the results to date. We have an assessment of alternatives being conducted under the aegis of MIT Lincoln Labs. And the results of that should be available by early spring, so that we'll know what the path is to developing such a capability. I think what we may find is initially the critical experiments that we wanted to conduct may well be with a Reaper. And I don't know this -- because the results aren't in -- but you've noticed I have not yet mentioned Global Hawk. And Global Hawk can go higher, faster and what-have-you. The advantage of Reaper is the platform that's on the Reaper is so adaptable to what we are doing. In fact, all that's required is to move the platform 23 inches forward so we get a greater uplook angle. And that's why we've been able so far to capture as much data as we have. So the jury's still out on that, but there's some advantages to this airborne business. One, you can get on-station more quickly; two, you can handle larger rate sizes than you can with other platforms. And as we think about going to space, we can then even handle even larger rate sizes. Land-based SM-3, of course, is part of the phased approach approved by the president back in September. And in our budget this year will be an authorization for the (80/60 ?) 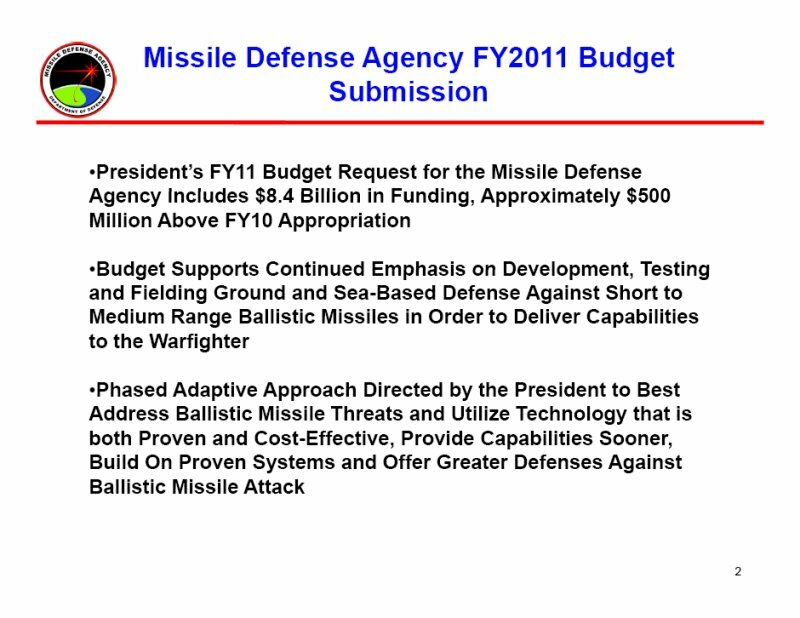 $8-1/2 million appropriated in '10 to establish a land-based test site at the Pacific Missile Range Facility, because obviously we can't test this capability in the host nation. And because we do most of our testing for Aegis at PMRF, it was not a big deal to say, well, this would be the place to be able to test that land-based capability. Now, in the Ballistic Missile Defense Review were the six goals that I have on this page. And as the secretary frequently announces, we are all in the department about people. And so the technology is wonderful and the industrial base is wonderful, but we can't do it without trained military and civil servants. So again, this emphasis on the homeland, regional, proven technology. And as the president said in Prague in July, it has to be proven and cost-effective. And flexibility, it can't just be something that is outmoded if we need to be able to evolve as the threat matures. And more and more, cooperation with our allies and friends is very, very important. And today we are working with about 20 nations around the world. We have a very mature program with the Japanese. Three of their four destroyers that are Aegis-capable have been over here and fired missiles, and the fourth one will be over next fall when it completes its overhaul and conversion to Aegis for its flight test. And as you all know, we have a -- we are preparing an FMS case for three THAAD batteries for the United Arab Emirates. 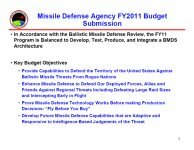 Q (Inaudible) -- missile defense. You talked about ABL moving over to DDR&E. Does that mean that all the funding and everything would be under DDR&E and not in MDA? MR. ALTWEGG: They will have all of the funding. We will have enough funding now -- this year -- to maintain the aircraft -- meaning maintenance -- and also to conduct some testing. But the budget drops off in '10. We have about $100 million available. MR. ALTWEGG: We have the upcoming test and we have up to three additional tests after that. Q Those will be done by DDR&E or they'll be done by MDA? MR. ALTWEGG: They'll be done by us. Q Thank you. Could you expand a bit on what MDA has said thus far about the test intercept failure yesterday and whether that, along with prior failures, is causing you to rethink at all your approach to flight testing in terms of maybe trying to do more tests, learn more rather than go the other direction? MR. ALTWEGG: Well, first, our intent is, at least until '20, one ground-based test per year. And we find out, with the pre-mission analysis that goes on and the post-flight analysis, to have that done thoroughly and prepare the round and correct things that we discovered on the previous flight test, one a year is about the limit, and it certainly is a challenge financially. What about last evening? A lot of us -- all of us -- were very disappointed. We have lots of data. We have convened a failure review board. I would guess it's going to be weeks -- no, it'll probably be months -- before we have absolutely pinned down what went wrong. Our intent, I believe, would be to do it over again when we are ready. Q (Off mike) -- or? MR. ALTWEGG: As soon as we are ready. First, we got to figure out what went wrong, correct what went wrong, and then conduct the test over. Now, I had mentioned previously that frequently targets are the driver. In this case, target will not be the driver. MR. ALTWEGG: We will have to change how we spend the money in ground-based if we want to do it this year. MR. ALTWEGG: Well, I'd -- (inaudible) -- reprogram, with the consent of the Hill. MR. ALTWEGG: You notice that I did not say it was the SBX radar. It is premature to attribute the failure to the -- I'm not exonerating the SBX, but I am not saying it was solely an SBX problem. Speculation is something I shouldn't be doing here. Let's find out what the data says. Let the Failure Review Board analyze it. And I should also we will have a second party looking at the same data, an independent team, so that we have high confidence that we will know exactly what went wrong. And I believe we have sufficient data to determine what went wrong. MR. ALTWEGG: That's part of the program. The goal of the program is 30 in the ground -- 26 at Fort Greely, four at Vandenberg -- and 22 for testing and four spares. So that would be 30, 22, 18, plus four. Okay? Eighteen test vehicles and four spares. Q Is anybody for air-launched hit-to-kill? MR. ALTWEGG: Air-launched hit-to-kill. Yes! We have been studying jointly with the Air Force, and I believe we have $3 million in the '11 budget to continue this joint effort. Now, the challenge is going to be, as in all cases, new ideas, new technology. Where does it all fit in a budget that is not unlimited -- well, a budget that's constrained, and we've heard the president -- yes, the Defense budget is exempted in '11, but who knows beyond '11? Q So does that money allow you to test, or is it just a study? Q Admiral, what's the latest plan for funding of Arrow-3? Last year, you had said that it wasn't clear that that was the best route. MR. ALTWEGG: Well, let me tell you. You may recall that we established knowledge points, several of them, for that program. And we also, I think, said this is a very high-risk endeavor. I can tell you that the Israelis have been proceeding at a reasonably good pace, considering the high-risk technology evaluation that we made, and in worst-case, is they are a quarter behind achieving their knowledge points. Now, it is early in the program, but I think it's not unreasonable to say that we're somewhat impressed by the progress they've been making. MR. ALTWEGG: We have offered that as an alternative, particularly in view of it being adjudged by us as a high-risk effort. They continue to feel that Arrow-3 -- their version, their configuration -- is the way to go. And we have not offered impediments to their efforts to achieve that capability. Q How much money is going towards that -- (off mike)? MR. ALTWEGG: Wait a minute. I may -- now, that may be a number I have -- no, all I know is their budget that we're sending over for David's Sling and Arrow-3 and finishing up Arrow-2 is 122 million (dollars). Now, it's no surprise to any of you, each year we send over a budget, and it gets modified in an upward fashion. It's over 200 million (dollars), was appropriated this year. Q But you're only adding 122 million (dollars)? MR. ALTWEGG: That's correct. It lives up to the promises we have made to the Israelis. MR. ALTWEGG: No, I didn't say East Asia. Q How do you plan that to work, as to what exactly is needed in those areas? How do you put these things together? MR. ALTWEGG: The word "global" will appear when we start talking about PAA; meaning we have a need today in Europe -- and I'll come back to that -- well, wait a minute, how about Northeast Asia? Well, wait a minute, what about the Gulf States? So today, studies are being conducted to see how we might apply the phased adaptive approach to the other parts of the globe. MR. ALTWEGG: Oh, the COCOMs are -- everything that we in the agency do is not -- we do what the war fighters want. 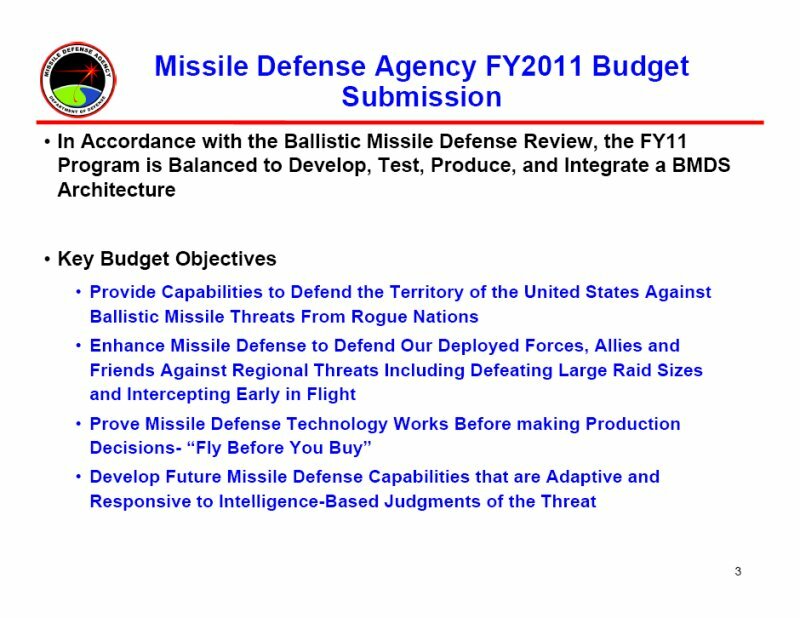 And I think I've told you previously -- and I'll come back to the PAA -- each year -- and we just have received a draft priorities capability listing, which is a product of the war fighters, the COCOMs, and STRATCOM, who is the -- it's in his job jar, global missile defense. That document is in our hands. We had a flag-officer review of it at the three-star level last week, and it was agreed to go back to the drawing board for a couple of weeks and then return the document. We then introduce it into our POM-12 deliberations. We come up with a document called a capabilities listing that we then send back, and that document says, "Okay, there are 37 things in this PCL. Here's stuff we can do near term, mid term and far term." And they then what I call grade our paper for the capabilities agreement report. And that's a process that'll go on between now and next fall, when our budget is due. Now, coming back to the PAA, as you know, it's in four phases. There's the phase in fiscal year '11, which is not very far in the future, kind of takes advantage of those things that are either fielded or approaching fielding. Then, in '15, are things that require some development, and we hope will be available in '15. And then '18 is when the Standard Missile 2A comes on line. And phase four would be a Standard Missile 2B. The other systems are the same, meaning THAAD, TPY-2 radar. We may have by '20 overhead sensors, meaning space. Prior to that will be the UAVs capability that we hope to start demonstrating in '12. Host-nation -- don't ask me where host nations are. They're undetermined. Q What happened to the money, the small sum that the Senate had inserted for a concept study on space-based test bed? MR. ALTWEGG: No, space-based interceptor. Q Space-based -- (inaudible) -- test bed. Q (Off mike) -- last three or four years. MR. ALTWEGG: I know, but it always was -- we put it in, and they disapproved it. They then came and told us, "Take $3 million and do a study on space-based interceptors," which is underway under the aegis of the National Academy of Sciences. Q And is there any money being sought in '11 for further studies? MR. ALTWEGG: No, not space-based. The only study going on is -- well, there's two. One, National Academy is doing a study, which just started two weeks ago, on boost phase. And we had this other study that we signed a contract with -- I'm sorry, the space-based interceptor study is a conglomeration of FFRDCs, and it should complete in '11. Q Question on the European plan that was announced last September. 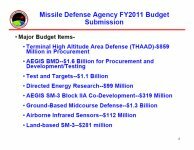 Will most of the money, the $5 billion or so over the next five years, be spent on THAAD and SM-3s and SM-2s, roughly? Where will the dollars be allocated? MR. ALTWEGG: Well, the THAAD batteries were being bought anyway. 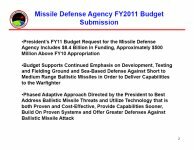 Now, the budget, though, that has been approved in the FYDB buys nine THAAD. And we now call them batteries, not fire units. And I would not be surprised, because the Army's objective back in the mid '90s was for 13. But right now we have visibility of nine. The Aegis Ashore is an entirely new endeavor. The first one of those installations, in a country yet not determined, is using RDT&E that was appropriated for the Polish endeavor, and the money was reappropriated and will be used for the first site. The TPY-2 to be used is going to be delivered in the fiscal year we're now in. And the (ABIR ?) effort is starting in '10, leading to experiments in '12. I mean, it's one thing to launch a UAV and get a beautiful picture of what is boosting, but we have to establish criteria, a requirement, and then see how well we meet the requirement. And then the CONOPS becomes very important. And you also find out along the way that weather plays a big role in the viability of a UAV capability. So there's -- we have a lot to learn, and we're working very closely with the Air Force in learning how to achieve such a capability. Q (Off mike) -- question. Last year you were critical of Raytheon's manufacturing an EKV program. You gave them a lecture at a (closed ?) conference. And General O'Reilly mentioned it in the hearing. MR. ALTWEGG: Well, I'm not going to name names today, but I'm going to tell you we continue to be disappointed in the quality that we are receiving from our prime contractors and their subs -- very, very disappointed; quality-design issues, but more in quality of products delivered, which then results in rework and which reserved -- because most of these contracts are cost contracts, it costs the taxpayer more. And we are probably -- the GAO, as a matter of fact, is coming to see us on the 4th, Thursday of this week, and the subject is quality. Q Could you just say, is it Boeing or Raytheon that are doing worse than before, or what? MR. ALTWEGG: We are having -- I am excusing no one from this conversation. MR. ALTWEGG: Continued would be the proper term. Q (Only in ?) Raytheon? MR. ALTWEGG: I'm not going to name names. We have problems with all of our primes. MR. ALTWEGG: That is one -- you might say no one is getting -- delivering poor quality and not paying for it. Q But the taxpayer is paying for it. MR. ALTWEGG: And that's the unfortunate aspect. But also the war fighter doesn't get products as quickly as they need them. MR. ALTWEGG: Well, you may find that they will be named perhaps later. Q Are you referring to across the layered system, or are you referring to ground-based midcourse, or what? MR. ALTWEGG: I'm talking across the enterprise. MR. ALTWEGG: (Inaudible) -- is a disappointment. Q Do you know why? I mean, do they just stink? I mean, is there, like, a unified root cause, or is it all very specific cases? MR. ALTWEGG: Lack of attention to detail. Missilery is all about detail. Q (Inaudible) -- examples of what you're talking about, some concrete examples? MR. ALTWEGG: Recently, THAAD had a firing exercise. It was a target to be extracted from the C-17. And, of course, as you know -- (inaudible) -- pulls out of the target. It then goes into a couple of parachutes, starts to drop through gravity towards the earth. And along about 20,000 feet, the booster motors light off and the target assumes the trajectory towards the firing unit. We all sat there and watched the target fall into the water. And subsequent analysis, Failure Review Board, disclosed a big-time quality problem. That's the most recent example. MR. ALTWEGG: It's all the above. Q As a contractor, they're responsible for their lenders. MR. ALTWEGG: Absolutely. That's all part of the contracting process. Q Is the missile test failure possibly a reflection of such quality control problems? MR. ALTWEGG: It was strictly a quality control problem. We know precisely what happened. That's why we convene the failure review boards. We just don't guess that something went wrong; we spend a lot of time and effort determining what went wrong and we absolutely determine what went wrong. Q But you just said it was strictly a quality control problem. Q Also you said it would take months to pin down the problem. MR. ALTWEGG: Now, the GMD test, it may. I'm not going to sit here and tell you, well, no, tomorrow or next week. I'm saying it may take up to months. MR. ALTWEGG: Well, I was talking about the THAAD test in December. We were able to find out -- well, we learned about the failure problem a weekend ago. Q But I'm asking a separate question. Does the failure of the test yesterday appear to reflect such quality control problems? MR. ALTWEGG: I have no clue. No clue. So I'm not going to say it was a failure problem. I don't know. MR. ALTWEGG: Well, they've been a continuing effort in our programs. MR. ALTWEGG: Well, as a matter of fact, back in the -- let's see, I came back as a senior executive in '87 and my first job in the Navy was as the deputy chief engineer for Design and Manufacturing Quality in the Naval Sea Systems Command, and I can guarantee you, things were bad then. Q So this isn't unique to missile defense? MR. ALTWEGG: Oh, I can't speak for the services now, but I know, when I was in NAVAC from '87 to '90 as the deputy chief engineer for Design and Manufacturing Quality, we had quality problems, particularly in ship-building and welding -- joining two pieces of metal together. MR. ALTWEGG: Well, I'm not going to -- I don't have visibility; I read the paper. Quality is a big problem. STAFF: I think we have time for one more. Q Excuse me, if you say that this has been going on for quite a while across the board but specifically also at MDA, what responsibility does MDA have for the continuing nature of the problem, the quality problem that you're talking about? MR. ALTWEGG: One, when I joined the agency almost eight years ago, we did not have a quality organization. We now have a quality organization of about 130 people. We have representation in all of our significant contractors' plants. We are working this problem assiduously. We conduct two-week in-plant reviews of those contractors that we feel are having difficulty who are not in here just to put people on report. We are interested in helping them get well, but we continue to have quality problems. Q Could I ask a budget question? The SM-3, Block IIB, is that a foregone conclusion that will be a Raytheon derivative product, or is there going to be an actual RFP competition for that capability? MR. ALTWEGG: If I had to tell you tonight -- and we don't have a contract -- I would guess it would be a derivative. Q Are you allowed to do that per acquisitionables, or do you have to compete it? 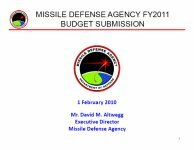 MR. ALTWEGG: No, we do not have to compete everything, although our goal, frankly, is to, and particularly because of the McCain-Levin bill, and that's why we are competing the development and sustainment of the ground-based system in the future. Q What's the acquisition plan for the Precision Tracking and Surveillance System? MR. ALTWEGG: We are working on the acquisition approach for that capability as I sit here. We're not done yet. It will probably be at least another six months before we arrive at an acquisition strategy. MR. ALTWEGG: Well, now, IA, IB, IIA, IIB? Q Well, not everything is broken down; it depends on what chart you're looking at, which is w hy I'm asking. I see 30 missiles in the request for testing purposes only, but for actual intercept missiles, operational missiles, I believe it's only eight. MR. ALTWEGG: Is that all? MR. ALTWEGG: No. No, IAs and IBs, over the FYDP, while extending into '16, we are doubling the inventory and the numbers are up about 430 or so. MR. ALTWEGG: Yes. 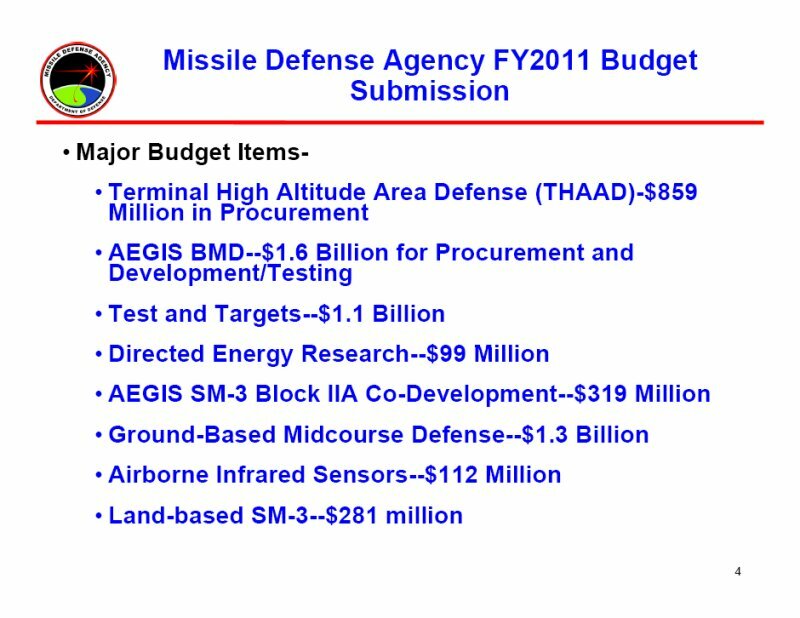 That's when you see the additional money in our budget -- that's for THAAD and Aegis missiles, mainly, plus the additional THAAD power units. MR. ALTWEGG: Yeah, about one more question. Q The GMD test that just took place right now, what other sensors were used in addition to the SBX? MR. ALTWEGG: The SBX was the sole active online participant. Q As far as operational capacity, then, if this were an actual attack, you'd be using more than one sensor, right? You'd have a redundancy of sensors, correct? Q Also, MDA and the Congress have been sort of working on this idea that testing should be operationally effective. How is this test operationally effective if you only use one sensor? MR. ALTWEGG: Well, there could be situations when that was the case. Q I thought your idea -- the whole idea of having more than one sensor was to have that redundancy during -- in an actual operation. MR. ALTWEGG: This test plan was just to use the SBX. Okay, see you next year.